EOS.IO is one of the latest and unique blockchain-powered platforms. Mainly focused on decentralization, Blockchain Developers use it to develop and deploy Decentralized Applications. Created by Block.one, a Cayman Islands Company holds the ownership of this platform. Based on smart contracts, developers can opt EOS blockchain to define the characteristics of their dApp. Using EOS blockchain, they can code their DApp as per the requirements. However, the blockchain technology has the issue of scalability. EOS blockchain platform claims to fix this issue for good. In comparison to the scalability of the existing employed worldwide financial framework like VISA, the scalability of the prominent blockchain platforms like ethereum is quite low. VISA can process thousands of transactions on its network per second (TPS). However, for bitcoin and ethereum, this number is still below 100. So, if millions of people are using a decentralized application developed on a decentralized platform, its scalability must be in the upper end. EOS blockchain aims at this issue. It wants to make its platforms suitable for development of commercial-scale decentralized applications. How does EOS blockchain platform do that? EOS applies a unique consensus algorithm at its core. 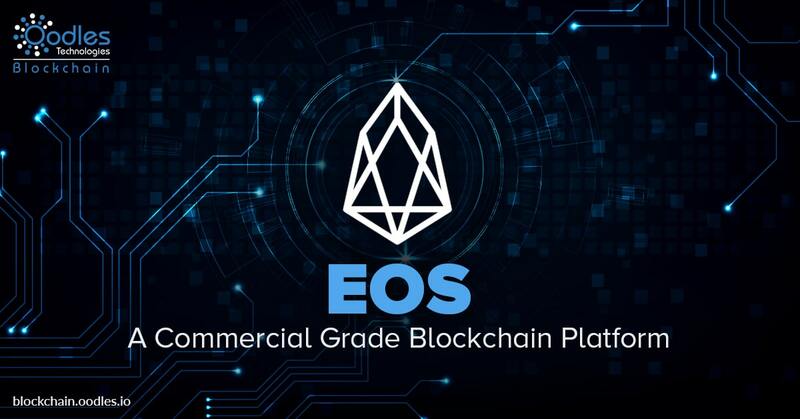 Instead of deploying standard consensus algorithms like Proof-of-Work (PoW), EOS makes use of the delegated Proof-of-Stake (DPoS). EOS deploys the Delegated Proof-of-Stake (DPoS) at its core, allowing it to forms blocks within 0.5 seconds. For obtaining irresistibility, the platform also uses asynchronous Byzantine Fault Tolerance (aBFT) along with DPoS. Altogether, these frameworks ensure that the transaction irreversibility is within less than one second. In contrast to the traditional PoS, where the token holders cast their vote for the confirmation of the blocks, the token holders decide to vote for block producers in the ecosystem of DPos. Now, the block producer group, capable of achieving the largest number of votes, votes and organizes the creation of the blocks. The initial step of the BFT-DPoS combination is the assortment of the group of block producers. The selection gets conducted on the basis of some pre-defined commands. Then, the top 21 block producers get selected through constant voting conducted by the EOS token holders. After the selection of the group, the next aspect is achieving consensus between the block producers. Disagreements get settled within this group of block producers through voting. It requires two-thirds (2/3) votes to get an agreement; 15 block producers need to agree on something to call it final. Then, it can be considered irreversible. The method of producing block also gets taken into consideration. All the block producers agree on the method in which the blocks will get produced. For producing a block, a block producer in the EOS ecosystem get 0.5 seconds. If a producer fails to create the block in the given time, it gets skipped. The longest chain in the group gets regarded correct. If a block producer finds a longer chain than the rest, he shifts to that chain. Transactions also get confirmed in the EOS ecosystem. All the transactions carry the header hash of the terminal block in the chain. If the terminal block is not available in the chain, the transactions get considered as incorrect. Competition in the blockchain world is cut-throat. Numerous decentralized application development platforms are getting launched with each passing day. So, now we’ll have to wait and watch who wins this race of becoming the most prominent blockchain development platform for Scalable and Fast DApps in the next few years.